You can download your (E-Aadhaar) Aadhaar card – Mera Aadhar Meri pehchan PDF file online from UIDAI official website. After applying for Aadhaar card you don’t need to wait for physical copy of aadhaar card which sent by UIDAI via post. You can download E-aadhaar card online after your Aadhaar number generated successfully. For some reason if you forgot your aadhaar card at home and urgently you need it then you can simply visit UIDAI website and download Aadhaar PDF file and take print out. If you have applied for an Aadhaar but have not received it yet, you can download a PDF of it online from the website. Step 2: You can download your aadhaar using Aadhaar number, Enrollment number. If you don’t know your Aadhaar number then use Enrollment number which is printed on your enrollment receipt. Select Aadhaar/VID or Enrollment option and enter the same. Step 3: New pop-up screen will appear, Click on Confirm. 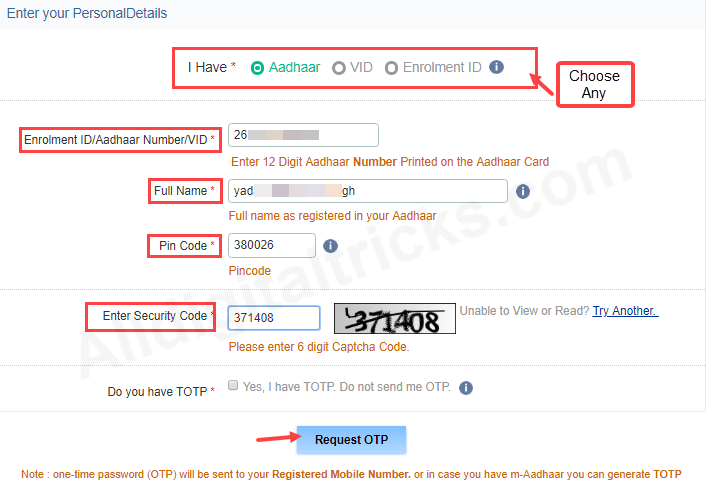 Step 4: Soon you will receive One Time Password (OTP) on your Aadhaar registered mobile number. 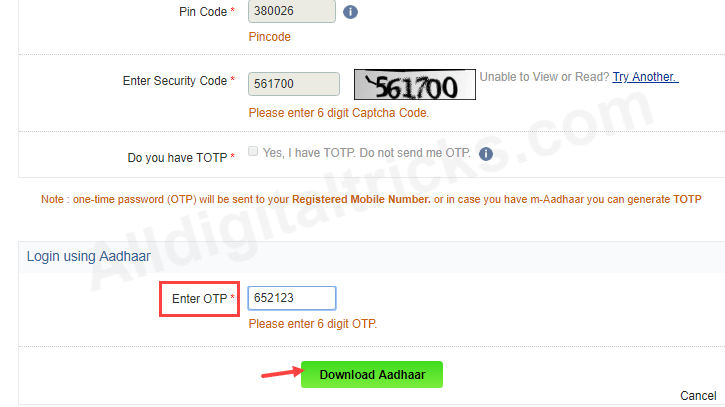 Enter this OTP and click on Download Aadhaar. Your Aadhaar Card PDF file will be downloaded on your computer/mobile. The Download E-Aadhaar PDF file is password protected so you need to enter password to open PDF file. Open PDF File, it will ask to enter password. Enter your Aadhaar name first 4-digit and Date of birth. So this is how you can Download Aadhaar Card (mera Aadhaar meri pehchan) PDF file online. Whenever your make any changes in your Aadhaar, download latest copy online anytime.